I don't think I could ever feel good about leaving town without knowing I have Quina here to love my dogs and hold down the fort. She is old now. She came to us when Henry, who is 23, had just been born. We hired her knowing nothing about her. Times have changed. She became our grandparent figure as unfortunately, our children didn't have grandparents for long. That is something I am sorry about. Quina and her husband, Jose, of 61 years, drive the 6 hour drive from Montclova, Mexico to San Antonio when we go out of town. There is a calming effect she has on me and mine when she arrives. She doesn't speak English. She doesn't understand so many things about contemporary life but her presence, her love, her patience and her acceptance of all things has a good effect on my impatient, racing, cramming character. She moves slowly now. I lost her in the supermarket today but luckily, because she moves like a tortoise, it wasn't for long. I try to teach her healthy eating and alternatives to her 100% Mexican diet but she prefers the things she knows; the dishes she has been making for her 6 children for more than 60 years. 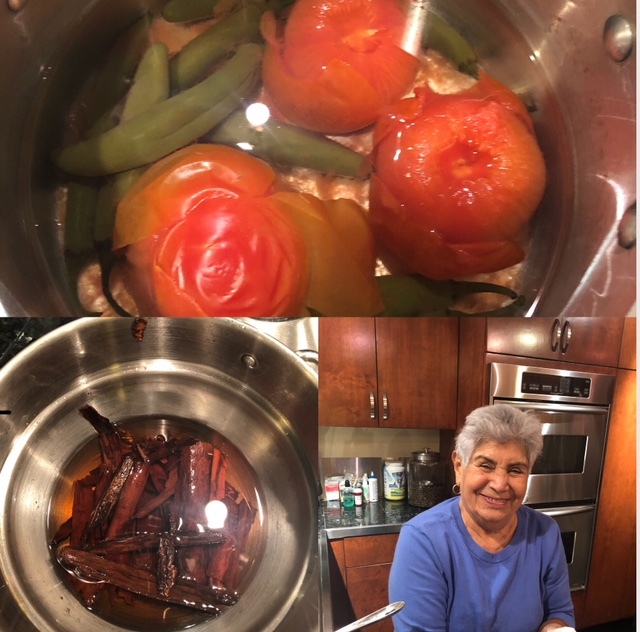 So here is a picture of her; her the' de canela and her preparations for her award winning salsa (that I am taking to the mexican restaurant in Florence and asking them if they can top it knowing that they can't). Please meet my rock - Quina Lopez.